Beach wedding gives you chance to experiment with your look! Read more to know about beach wedding accessory. A beach themed wedding is the perfect way to tie a nuptial knot. 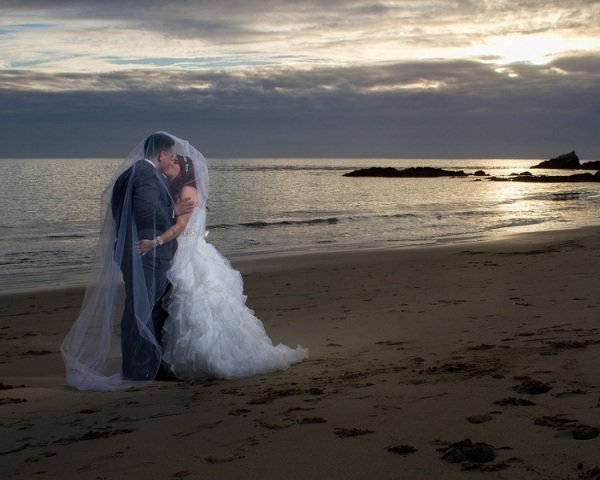 Sturdy and consistent, a beach offers a perfect backdrop for starting a new life together. When it comes to beach wedding, you might be confused between what to wear and what not to wear? However, beach themed wedding needs special consideration, when it comes to picking dresses and accessories. Whatever you wear to a beach wedding, khaki shorts and tank tops is a strict no no! Don’t be the one, who spoil wedding photographs with their funny dressing sense. Similarly, coastal winds can send skirts flying, so better avoid short and flowy dresses! If you are a bride-to-be then, you have to be all the more careful about what you are picking, as you will be the center of all attention. Beach wedding gives you a golden chance to look both casual and stylish. So, why not pick a stylish dress and accessorize with seashells, pearls, nautical jewelry and set into the mood of beach wedding theme! While shopping for an upcoming beach wedding, keep in mind the time of year and expected temperature. Here are a few pointers, which will help you in picking right accessory for your beach wedding. Beach weddings are considered more informal than a church wedding. Full-length formal skirts and headpieces are not what are required for a beach wedding. Instead, what looks appropriate is a sleek and casual style. What you need to opt for your wedding dress is beautiful yet informal wedding gown. From halter, sleeveless, to strapless, there are varieties of options to choose from. So look classy and elegant with your pick without being dressed like a Christmas tree. Since beach wedding requires casual attire, a wedding veil in most cases is not required. If you want to complement your dress with a veil, then you will need to pick one, which matches with the style of your dress. A bride should look like a bride irrespective of what she wears. When it comes to bridal jewelry for a beach wedding then, you should be very selective. Formal pearls might not go along with your wedding dress, as they are best suited with a formal wedding dress. Seashells can be your perfect choice! You can pick from a large variety of seashells to make your perfect bridal jewelry. Whether you are looking for bracelets, anklets, necklace, or earrings, you simply can’t go wrong with seashell jewelry. It is a must-have beach wedding accessory! You can also opt for freshwater pearls. You can try pink pearls in contrast with your white dress. They too serve as a great wedding accessory! For accessorizing your hairstyle, you can wear flowers, pearls, or a simple but beautiful hair band. You don’t need to have an elaborate hairstyle. You can pull your hair in a stylish ponytail or leave them open. If you have planned your beach wedding at around midday under the scorching heat of the sun then, a straw hat or beach hat can be a great fashion accessory. If you are a bride then, you can opt for a white hat with some shells or pearls to complement your beach wedding theme. Your guest can pick hats of their choice, matching their dresses. Shoes are an optional beach wedding accessory. Most brides prefer to walk barefoot to complement the theme of beach wedding. Whereas there are also some, who would not like to feel sand in between the toes. Usual satin bridal pumps won’t be a great choice for the occasion. You can opt for flip-flops but instead of opting for plain flip-flops, opt for jeweled ones to give you a classy look. Opting for a pair of strappy sandals can also be a perfect choice! Bridal purse is an essential accessory, which complements any wedding theme and is a must have for a bride. Stock your purse with tissue papers in case the make-up sears up, a small perfume bottle and lipstick. They are must-carry items for your purse. Remember that it can get breezy even at beach weddings so you shouldn’t forget a bright color pashmina shawl or an alternative wrap.